Several bands are called Faust: Faust is a German krautrock band, originally composed of Werner "Zappi" Diermaier, Hans Joachim Irmler, Arnulf Meifert, Jean-Herv? P?ron, Rudolf Sosna and Gunter W?sthoff, working with producer Uwe Nettelbeck and engineer Kurt Graupner. The group formed in W?mme in 1971 and soon began recording their debut, "Faust", which sold poorly, but established a devoted fanbase. With a series of early 1970s releases, Faust became one of the most significant bands in the genre that would eventually be known as krautrock. Faust is a German krautrock band, originally composed of Werner "Zappi" Diermaier, Hans Joachim Irmler, Arnulf Meifert, Jean-Herv? P?ron, Rudolf Sosna and Gunter W?sthoff, working with producer Uwe Nettelbeck and engineer Kurt Graupner. The group formed in W?mme in 1971 and soon began recording their debut, "Faust", which sold poorly, but established a devoted fanbase. With a series of early 1970s releases, Faust became one of the most significant bands in the genre that would eventually be known as krautrock. Faust became one of the first acts to sign to Richard Branson's Virgin Records, who issued the band's "The Faust Tapes" at the price of a single, 49 UK pence, leading to a chart placing in the United Kingdom. 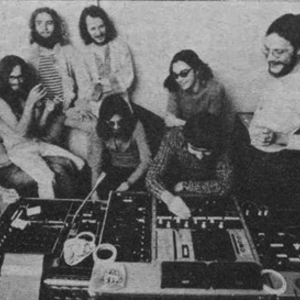 Faust were arguably the most radical of the groups of their era, using advanced studio techniques and electronics in a way that opened up new possibilities for studio composition. At the time they may not have appeared to have had the same impact as a number of their German peers (notably Kraftwerk, Can and Tangerine Dream), but they are increasingly recognised as the most far-sighted of the German groups of that era. Faust broke up in 1975 after Virgin had rejected their fifth album (some of the recordings later appeared on the "Munich and Elsewhere" album), but reissues of their recordings and various additional material through Chris Cutler's Recommended Records maintained a level of interest. The groups' activities between 1975 and 1990 remain shrouded in mystery. In 1990, members Irmler, Diermaier and P?ron reunited for performances, including touring the United States for the first time. They have continued to perform in various combinations and with various additional musicians ever since. P?ron left the group in June 1997. From mid-1997 to 2004, Faust tours as Zappi W. Diermaier, Hans Joachim Irmler, Steven Wray Lobdell, Lars Paukstat, Michael Stoll. Diermaier and "art-errorist" P?ron rejoined in 2004 by immediately recording Trial and Error, a DVD released in 2007 by Fuenfundvierzig Label. Zappi proposed to P?ron to start a "new" Faust together with Olivier Manchion and Amaury Cambuzat from Ulan Bator. Faust now exists in two completely different incarnations, both active and each reflecting different aspects of the original group. Uwe Nettelbeck, Faust's creator and producer, died 17 January 2007. Faust's influence has been wide-reaching, and continues to this day, most notably in the music of post-rock, noise, and electronic artists. Faust is early 90s heavy metal band from Subotica, Serbia (ex-Yugoslavia). They released two albums in their homeland, and one in Hungary. Faust is a Symphonic Metal band from Russia. Faust is a german band with members from both Noie Werte and Kraftschlag. Faust is a Death metal band from Milan Italy. Formed in 1992, their first full-length album - From Glory to Infinity was recorded with highly talented and well-known musicians. Steve DiGiorgio ( Sadus, Death, Quo Vadis... ) on bass, Darek "Daray" Brzozowski ( Vader, Dimmur Borgir ) on drum, and Aleister from Ancient, Luca Princiotta on guitar.